Karl Marx, philosopher and economist (1818–1883). Portrait photograph. [London, 1875]. 96 × 144 mm. Albumen print (vintage), mounted on backing cardboard from the issuing studio of Anton Markreiter, Vienna. 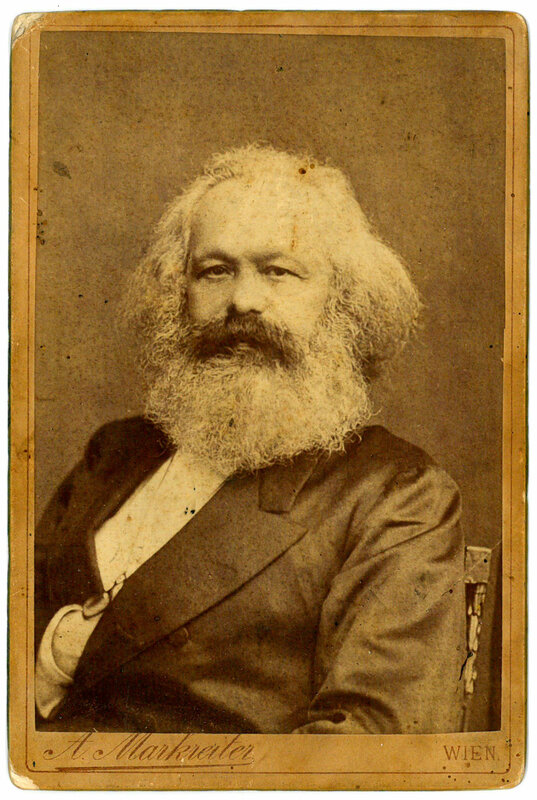 Detail of one of the four photos of Marx that the London photographer John Mayall jr. (1842–91) made in rapid sequence. On 25 August 1875, Mayall wrote to Marx that he had mailed him some of the prints the previous day and the remainder would follow in the course of the week. Mayall was the son of the photographic pioneer John Jabez Edwin Mayall (1813–1901), who in 1860 took the first carte-de-visite photographs of Queen Victoria. The renowned Mayall studio had produced a fine portrait of Marx as early as 1872 (it was used as a frontispiece in the first livraison of the first French edition of “Das Kapital”). The four 1875 Mayall portraits went on to become Marx’s most widely disseminated likeness: after his friend’s death in 1883, Engels ordered 1200 prints to send to socialists all over the world, deciding that this was “the final, the best picture, showing Mohr [his nickname for Marx] in all his serene, confident, Olympian calmness”. The present specimen, likely one of the set produced in 1883, was distributed by the Viennese anarcho-socialist Anton Markreiter (d. 1908). Born into a bourgeois family and trained for the military, Markreiter escaped the stifling drill of the Austrian army, finally settling as a photographer in Vienna’s Hernals district. A pioneer of the Austrian workers’ movement, he also published socialist and atheist treatises under the name of “Quidam”. Some spotting, corners of cardboard somewhat bumped, but a fine example. ¶ Cf. IISG call no. BG A 9/363.